In addition to mounting works from their classical repertoire, Opera Theatre St. Louis also commissions new work that speaks to a modern audience by engaging them with presentations featuring contemporary themes without sugar coating or smooth edges. Dubbed New Works, Bold Voices these commissions also affords new voices to be heard both on and offstage, establishing OTSL as an internationally respected company that is not afraid to challenge viewers or tackle difficult issues. This brings us to the boldest experience of their 34th season, An American Soldier. This world premiere opera is nothing short of mesmerizing. Its dynamism fearless pushes multiple hot buttons (hazing, bullying and racial discrimination to name just a few) in an effort to confront injustice and abuse in the military head-on. 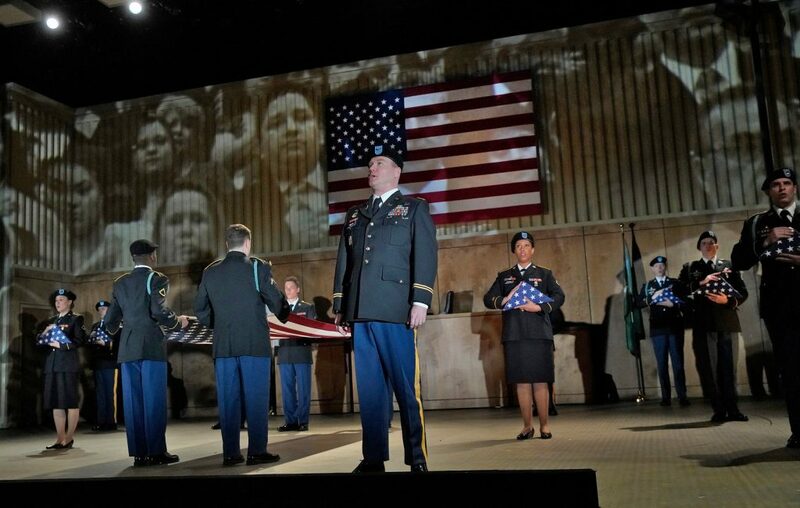 Leaving no dry eyes behind, An American Soldier may well be the most emotionally important work produced by OTSL in recent years. Vital and important, it tells the story of Danny Chen, a Chinese-American GI eager to make a name for himself by serving his country only to find his patriotism muted by bigotry and hatred. Told through real time and flashbacks while also using the courtroom setting as a visual motif, An American Soldier is thoroughly uncomfortable from start to finish. At times hazardous to navigate, it begins with Chen’s superior facing trial before recounting his teenage ambition to serve his country. From here on there is no turning back. Things get real. Once enlisted he is under siege for six weeks, facing harsh his own barrage of hazing, racial slurs and repeated volleys of emotional and physical abuse from his commanding officer and fellow soldiers. Initially resilient and gritty, Chen’s spirits are broken by the unrelenting actions of his brothers. Coming from a close-knit family in Chinatown, New York, Chen is a pretty tough kid. Mentally sharp, Chen is prepared to be all he can be. Despite his toughness and determination. 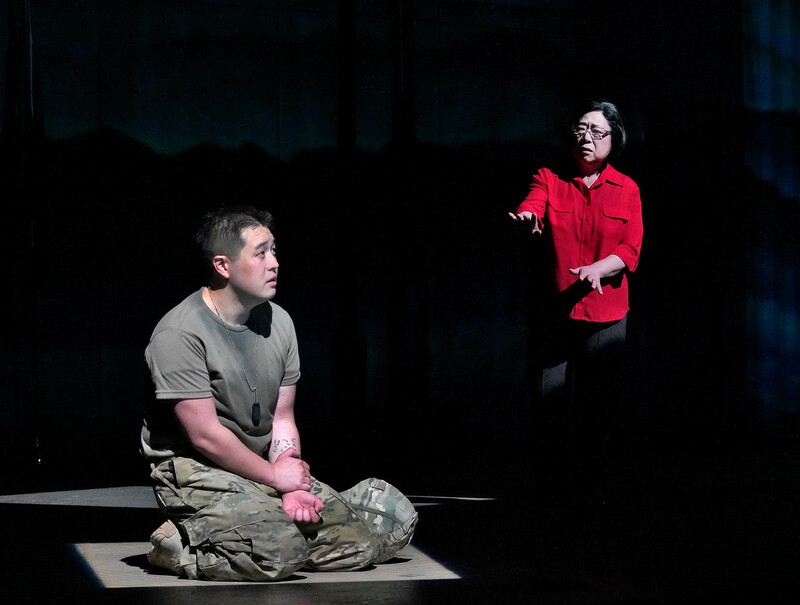 Danny’s enlistment worries his mother and sister (a character invented for this production) who fear that his deployment in Afghanistan could be more dangerous than he expects. Fast forwarding to 2011, Chen is dispatched to active duty in the Middle East Chen. There he encounters Sgt. Marcum, an old school Army commander whose racist taunts and physical hazing test Danny’s mettle daily as takes his C.O.’s vicious cruelty. Singled out, scorned and browbeaten Chen’s fortitude weakens, pushing him deeper and deeper into a despair that would eventually cause him to take his own life. After Chen’s death, Marcum faces a court-martial on multiple charges. It is this trial that frames the tension of the opera, building a rhythmic crescendo fraught with anger, oppression, and ugliness. Facing the daunting task of starring in a high profile world premiere, Andrew Stenson is flawless as Danny Chen. Debuting with OTSL, he wears the role as if it were is own cross to bear, resulting in an emotional connection to the audience that is unbreakable. Calling Stenson’s poignant turn a breakout performance would be a serious understatement. He is nothing short of riveting for the entire opera. There is nothing like the bond between a son and his mother. Here this kinship is brought to the forefront thanks to an excellent performance from Mika Shigematsu as Mother Chen. Equal parts raging and mourning her inexorable portrayal of a parent ceaselessly working to bring those who hurt her son to justice. Kathleen Kim stars as Josephine, Danny’s altruistic sister. Onstage is presence is electrifying an impossible to turn away from. Serving as Danny’s moral compass and confidant she drives the most intense scenes with seamless ease. She is a star on the rise. Created with a straightforward honesty that challenges the audience while moving them to tears, composer Huang Ruo and librettist David Henry Hwang have birthed something seminal, resolute and vivid. An American Soldier is a thought-provoking behemoth that simply will not be ignored. Firmly entrenched as the most controversial opera of the season it is a masterpiece executed to perfection.